Hawaii’s Historical English-Language Newspapers Exhibit, 2012. Check out the new exhibit at Hamilton Library on the 5th floor in the Hawaiian/Pacific Collections, of articles from Hawaii’s historical English-Language Newspapers. It sounds fun and informative. I will be headed over to check it out soon! This past Tuesday [1/30/1912], Waihokaea Waiwaiole (f) expired, at 51 years of age, at Manamana. She is a blood relative of Captain Duke Kahanamoku. Ke Aloha Aina, Buke XVI, Helu 5, Aoao 4. Feberuari 3, 1912. 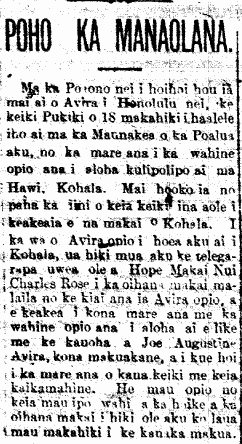 A. D. Hale to Lokalia Wahinenui, January 13. Mark Robinson Houghtailing to Daisy Zerbe, January 20. Lester Petrie to Mary Kamala Crewes, January 25. To John Keliikipi and Nawaa, a son, January 6. To William J. Jellings and Eelyn [Evelyn] K. McGuire, a daughter, January 24. Kuheleloa, in Manoa Valley, January 24. Matthew Duchalsky, at Koula, January 25. L. Kaehu, on Auld Lane, January 25. Umi, at Leahi Home, January 26. Hannah Kalua Enoka, on Liliha Street, January 26. Matthew Kimokea, on Coral Street, January 27. Eddie Kekoa, at Queen’s Hospital, January 28. Emily Madesky, on Hustace Street, January 28. Mrs. Annie Rufus Titcomb, on Waiakamilo Street, January 28. George Keliiku, at the Children’s Hospital, January 29. Julia Apana, on Maunakea Street, January 29. Waihoikaea, on Aloe Lane, January 30. 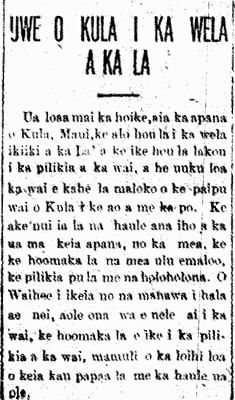 Ka Nupepa Kuokoa, Buke XLVIII, Helu 5, Aoao 8. Feberuari 2, 1912. More drought on Maui, 1912. According to the news from Hana, Maui, this is one of those years that great drought is seen there, and being that there are no rivers flowing down from the mountains to bring satiating water, the people there are facing serious trouble. Drought in upcountry Maui, 1912. We have received word that the district of Kula, Maui is once again faced with humid heat, and they are distressed over water; there is little water flowing through the pipes of Kula both day and night. There is a great need for rain to fall in this district, because the crops are beginning to dry out, and the animals are also suffering. Before, Waihee was known never to have water shortages, but they are starting to see problems due to lack of water because of the length of this period of drought with no rainfall. Ke Aloha Aina, Buke XVI, Helu 5, Aoao 1. Feberuari 3, 1912. Death announcement for George W. Lincoln, 1912. Mr. Editor of the Newspaper Kuokoa Home Rula, we are full of emotion:—Please allow us a space in your columns for the headline written above, and it is for you to send it before our dear readers who live throughout the Territory of Hawaii nei; and that being this below. Exactly at the hour of twelve on the night of the first of January, 1912, our dear Papa, George W. Lincoln grew weary of this life, and passed over to the other side of the black river of never-ending death. He was ill for six months and tried medical treatments, but to no avail. It is he who giveth and he who taketh away. Blessed be the Almighty Heavenly Powers, who gives protection on this earth, and aloha to the children of man. He was born at Keawewai, South Kohala, Hawaii, in the month of December, on the 15th, 1839, and died at Kailua on the night of the 1st of January, 1912. Therefore, our beloved father had 72 years plus seventeen days of life in this world of strife, and then passed on. He left behind his new wife (Mrs. Kaohe G. W. Lincoln), along with his children with his former wife, Mrs. Rebecca Bell, who previously left on that path taken alone (death); they grieve and lament for him for all times; and he also left behind many grandchildren. Therefore, with this short prayer, we end here, with grief and heavyheartedness for our beloved father who has gone. We, his own children, who witnessed his last breath. Kailua, North Kona, Hawaii, Jan. 20, 1912. Kuokoa Home Rula, Buke X, Helu 5, Aoao 2. Feberuari 2, 1912.